I was introduced to Altos de Luzón, a wine from Jumilla, this past winter and was entranced by a small, relatively unknown wine region in southeast Spain that has been growing grapes and making wine for over 5,000 years. 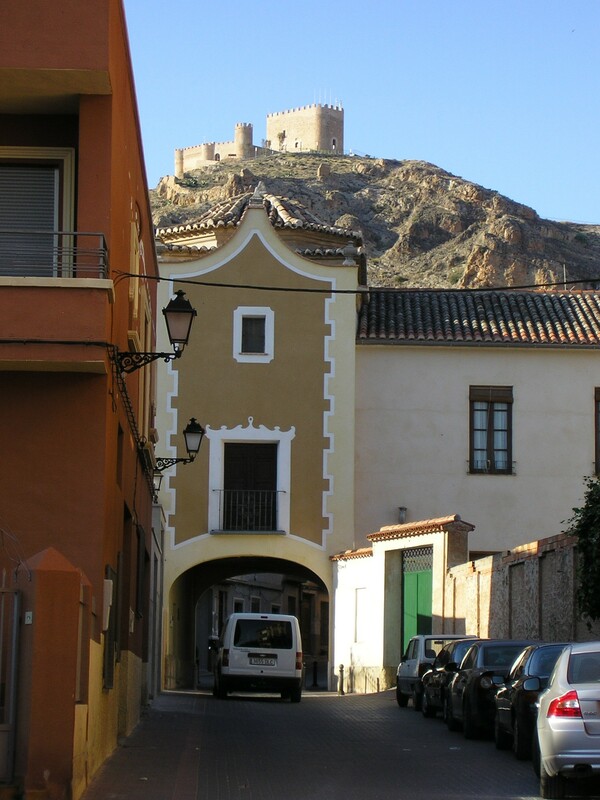 When I was planning a holiday in Spain, Jumilla was my go-to destination. As I stepped off the bus from Murcia and began walking up the esplanade, the 15th century castle towered above me. It is the focal point for miles around, a sheltering presence keeping watch over the region’s 45 wineries that harvested 80 million kilos of grapes in 2010. I spent my first afternoon in Jumilla sipping wine in the town’s central downtown park. After paying three euros for a wine glass, I meandered from one winery’s display to another, filling it with samples of a wide range of wines. Where else but in Spain’s wine country could you drink wine in a public park! 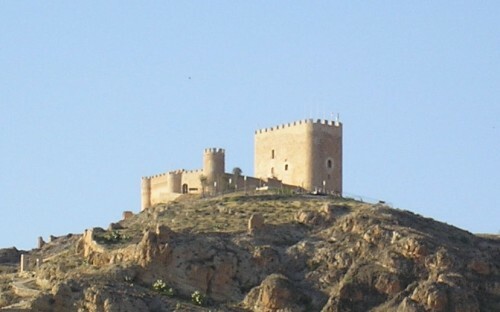 Jumilla has a demanding climate and geography. The region is 400-900 feet above sea level, so it does not experience the extreme heat of coastal Spain and winters can be quite cold (I saw photos of vineyards with a light coating of snow). Hot daytime temperatures are matched with cold temperatures at night, so plants must be able to withstand extreme temperature changes. The area receives 3,000 hours of sunlight annually–but very little rain. Eighty percent of the grapes grown in Jumilla are an indigenous variety called monastrell. It has evolved and adapted, flourishing under the harsh conditions of Jumilla. The vineyards are not irrigated so the vines are grown as bushes and spaced far apart (approximately 2.5 meters). They would lose too much moisture to evaporation if they were trellised, and the plants require an extensive root system in order to obtain sufficient moisture. The monastrell vines in Jumilla have a low yield, but the fruit is rich in concentrated flavor. First of all, non-irrigated vines produce much less fruit than irrigated vines (1.5 kilos as opposed to 7). Secondly, monastrell is resistant to phylloxera, so the region still has a great many old vines that are 25 to 60 years old. Old vines also produce much less fruit compared to young vines, but the wine is typically outstanding. Jumilla has 45 wineries, ranging in size from Bodegas Viña Campanero, a small artisan winery producing 20,000 bottles (or 15,000 liters) of wine a year to Bodegas San Isidro, a cooperative with 600 members and 700 tanks holding between 20,000 and 2 million liters of wine each, up to 130 times as much as Bodegas Viña Campanero. Until very recently, Jumilla has played a supporting role in the international wine market, selling wine locally and supplying bulk wine to other wineries to increase the colour and alcohol content of their wine. Fifteen years ago, the winemakers of Jumilla realized that they were no longer satisfied with supporting the efforts of other wineries. They wanted to sell their own wine and build their own brands. Now they are doing just that. Exports are steadily increasing, while bulk wine sales are decreasing rapidly, from almost 3.7 million litres in 2008 to less than 2.5 million in 2010. 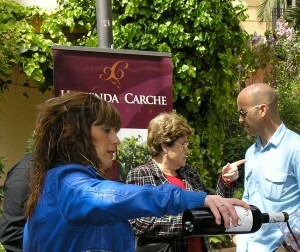 A number of the wineries have already gained a solid international reputation–Bodegas Bleda, Bodegas Casa Castillo, Bodegas Juan Gil and Bodegas Luzon. All of them are focusing greater attention on exports as Spain’s poor economic performance over the past few years has led to a significant decrease in local and national sales. Single varietal Monastrell wines are Jumilla’s signature product. The highest-quality grapes are delivered to the winery in small baskets and sorted by hand. The grapes from each parcel are fermented in separate containers before being aged for 4-12 months. The result is a smooth, full-bodied wine that is naturally high in alcohol, and it is proving popular in the United States, due to consumer familiarity with the bold wines of California. The wineries also produce young monastrell wines that have not been aged in addition to blended wines. For example, one of my personal favorites is Altos de Luzón from Bodegas Luzón, a balanced blend of 50% Monastrell, 25% Tempranillo and 25% Cabernet Sauvignon. 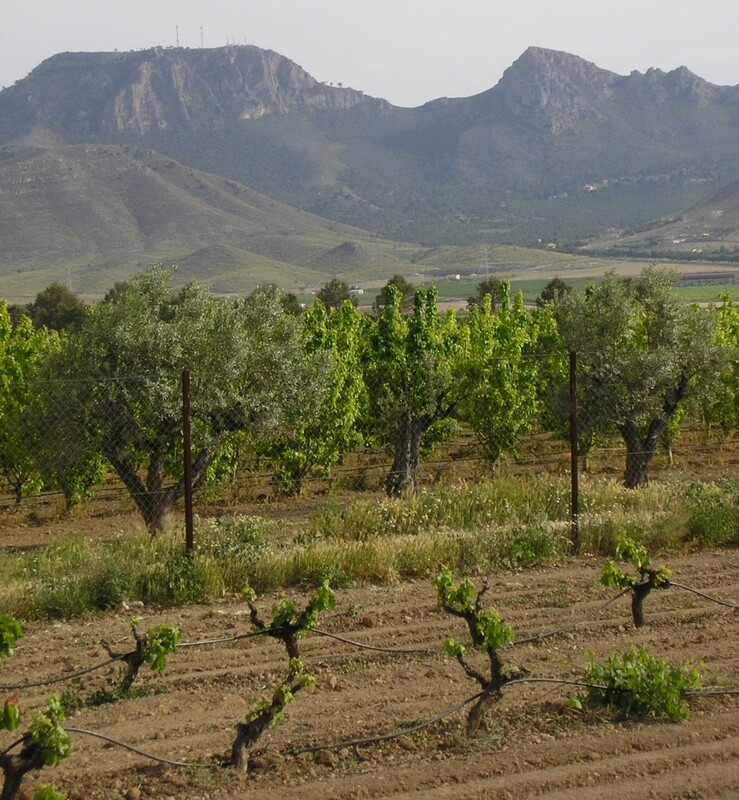 Thanks to a dry climate and inorganic soil, pests and fungus do not trouble Jumilla’s vineyards so there is no need to use chemicals to prevent these issues. As a result, many of the wineries are producing organic wines that are proving very popular in northern Europe. This is an increasingly useful selling point in North America as well. The dulces or dessert wines, from late-harvest monastrell grapes are aged in oak. They are rich, complex and well worth savoring. 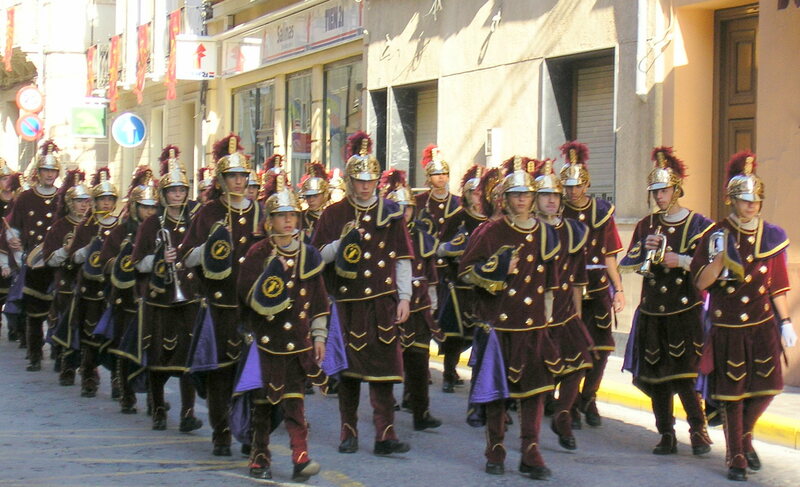 I spent four days in Jumilla in April and wish I could have spent four weeks. There are very few tourists, so it was an opportunity to share tapas with the locals and enjoy authentic paella in a restaurant bustling with large Spanish families enjoying Sunday lunch. I was particularly fortunate to be in Jumilla just before Easter as the residents celebrated the town’s 600th Semana Santa. 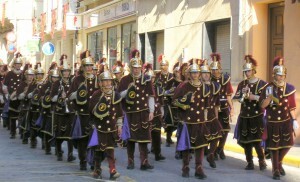 The parades were a mix of pageantry and community party, and everyone, from very young to very old, participated. I saw mothers carrying toddlers and tiny tots solemnly observing their fathers as they tried to keep the beat. The processions are very informal, with the parade master calling for a halt so that amateur photographers can get a good shot. 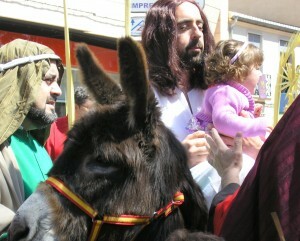 Jesus paraded through the streets on a donkey on Palm Sunday, and he stopped for photo opportunities with babies and young children. Nearly all the wineries offer tours and many of them are located within walking distance of the town centre. Bodegas Silvano Garcia does an exceptional job of educating its visitors with an aroma room illustrating 43 of the different flavours that can be detected in wine. These range from a hint of strawberry in a rosado (rosé) wine to chocolate, vanilla or thyme in a crianza (aged) wine. Bodegas Viña Campanero has a small museum and a restaurant. In June, the Ruta del Vino Jumilla tourism association sponsors a series of winery-hosted concerts that are extremely popular, and a retired British couple, Sue and John Walker, offer free tours of Jumilla in English. Although Jumilla wines do not currently enjoy wide distribution in North America, they are extremely good value for the money, and I believe that we will see more and more of them on store shelves. In addition, as the wineries develop their brands and become more familiar with the export market, there will be increased differentiation. Although the primary focus at the moment is on aged Monastrell wines, I believe that the wineries will begin to introduce more blends as well as more rosados. These are wineries with a long tradition of winemaking: we can look forward to enjoying their very good wine in years to come. 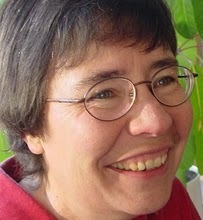 Penny McKinlay is a freelance writer and editor in Saskatoon, Saskatchewan, Canada. Her blog, Wanderlust and Words, provides profiles of culinary entrepreneurs and businesses both locally and internationally. Very nice article Penny. While I am focusing on California wines and wineries (I live in CA) I do love to explore new horizons. 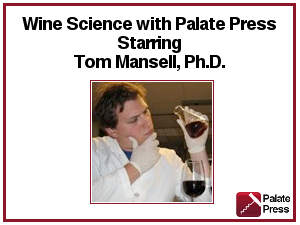 This article will have me looking for a monastrell soon. Hey Penny, being from Alberta we have tried over many year’s a great variety of different producers from Jumilla and that wonderful grape. Love to read articles about a region and never surprised by the lack of knowledge of region that produces excellent wine at a very reasonable price. Monastrell is another name for Mourvedre. It appears to have Spanish origins, but is widely grown in southern France and is increasingly popular in Australia and California. It buds and ripens late so it requires long, hot summers. Resistance to phylloxera is not a characteristic of the vine but of the dry, sandy soils of Jumilla. Phylloxera did arrive in the area in the late 1980s, causing much of the vineyard to be torn out, and producers adopted a more quality-oriented focus motivated by the effort and expense of replanting. a great enthusiasm, maybe it should be better to be a little less confident about history and something else. Sometime we trust too much in marketing brochures. i.e. : is it true that 3000 years before Christ in Jumilla they had been producing wine? If yes, this is absolutely an historical scoop, to be published by the best revues..
and “Where else but in Spain’s wine country could you drink wine in a public park?” let’s guess… could be in Burgundy, Alsace, Bordeaux, Champagne, Languedoc, Provence, Cote du Rhone, Mosel, Rheingau, Pfalz, Tokay, Baden, Bodensee, Austria, Friul, VAlpolicella, SüdTyrol, Franciacorta, Bardolino, Barolo, Barbaresco, Langhe, Roero, Tuscany, Sicily, Umbria and more? Thank you all for the feedback. This was a short article and it was certainly flavoured by my personal response to a short visit to Jumilla, so I appreciate the additional information that has been provided in the comments. Do they know for sure that wine was being produced in Jumilla? No, but archaeologists have uncovered 5,000 year old grape pips and grape cluster earrings from the 4th century BC, so it’s not an unreasonable assumption. On the other hand, I did obtain that information from local tourism material, not from an academic publication. Thank you again for commenting – great discussion! What i don’t realize is in fact how you’re no longer really much more smartly-appreciated than you may be right now. You are so intelligent. You know therefore considerably in terms of this matter, made me in my view consider it from numerous numerous angles. Its like men and women aren’t interested except it is one thing to accomplish with Woman gaga! Your personal stuffs nice. Always care for it up! 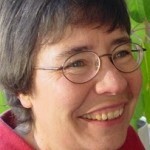 I’ll bookmark your weblog and check again here frequently. I am quite sure I will learn plenty of new stuff right here! Best of luck for the next!